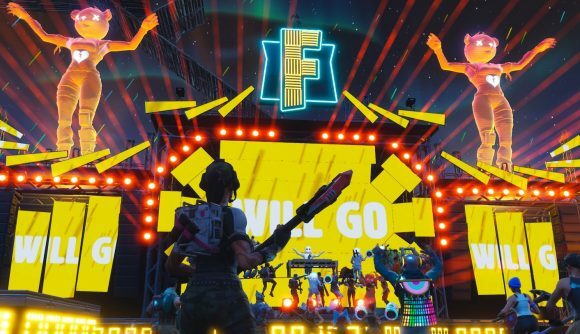 When Marshmello performed his set Saturday in Fortnite’s Pleasant Park, the game saw a peak of more than 10 million concurrent players. That’s according to Game Awards founder Geoff Keighley, and if he’s right, that would make Marshmello’s show about three times as well-attended as the biggest-ever concert in the world. Of course, it’s not exactly fair to compare an online event such as ‘Mello’s Pleasant Park set with real-world shows, where you have to fit actual people into real space, but let’s just consider it for a moment. If Keighley’s sources are correct, that 10 million figure dwarfs Rod Stewart’s 1994 New Year’s Eve show in Rio de Janeiro’s Copacabana Beach, which holds the Guinness World Record for the highest attendance at 3.5 million. Marshmello’s show Saturday was only about 10 minutes long, but the set was a brief glimpse at what concerts could look like in the future – and the apparent success of his show only indicates that it’s all the more likely now. And of course, Marshmello isn’t the first performer to hit it big by melding performance and videogames. League of Legends developer Riot Games has been using the success of its virtual K-Pop group K/DA to pivot into a “full-fledged music studio” after their song POP / STARS debuted at number one on the Billboard world digital song sales chart in November. Twenty years before all of this, we were introduced to the Gorillaz, another virtual band composed of animated 2D characters. So Marshmello’s Saturday show is just the latest point on a convergent path of art, games, music, and animation that started a couple decades ago.